The Wholesome Foodie: Pumpkin Spice Muffins with Protein Cream Cheese made with Jamie Eason's Natural Whey Protein! 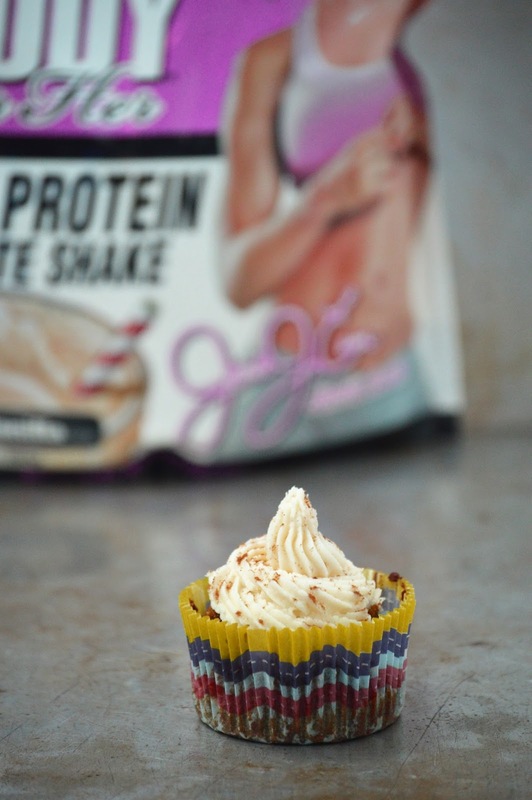 Pumpkin Spice Muffins with Protein Cream Cheese made with Jamie Eason's Natural Whey Protein! I recently received a different protein powder than I'm used to, and I'm absolutely in love! Not only does this protein meet the quality standards that I stick to, it's delicious and especially good in recipes. I was playing around with ideas the other day and came up with this delicious protein cream cheese frosting using the protein found here! These muffins are full of flavor and spice. 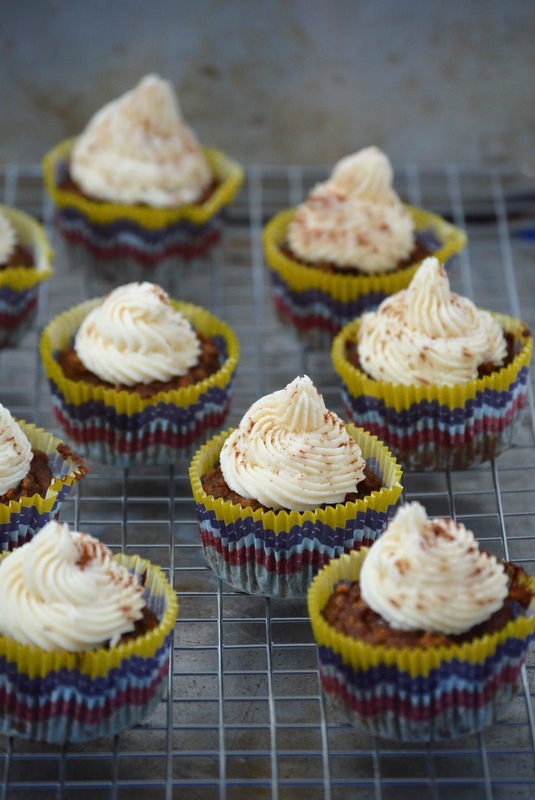 The cream cheese frosting compliments them absolutely perfectly. As always, they are grain-free, natural, and delicious! I hope you enjoy these as much as my family and I did! 1. In a stand mixer, combine pumpkin puree, sweetener, vanilla and lemon juice until smooth. 2. Add in eggs, one at a time until well-combined. 3. Add cinnamon, nutmeg, ginger, sea salt, and baking soda until mixed-through. 4. Finally, add in coconut flour, 1/2 cup at at time until all elements are finally combined. 6. Spoon out mix so that the liners are about 70% full. 7. Bake for 12-18 minutes or until a toothpick comes out with a few crumbles. 8. Remove from oven and place on cooling wracks until completely cool. 9. Follow with protein frosting recipe. 1. Combine cream cheese, maple syrup, and butter until whipped. 2. Slowly add in protein powder, 1 tablespoon at at time until mixed-through. **Do not over-whip! 3. Leave at room temperature until muffins are cooled enough to frost. 4. 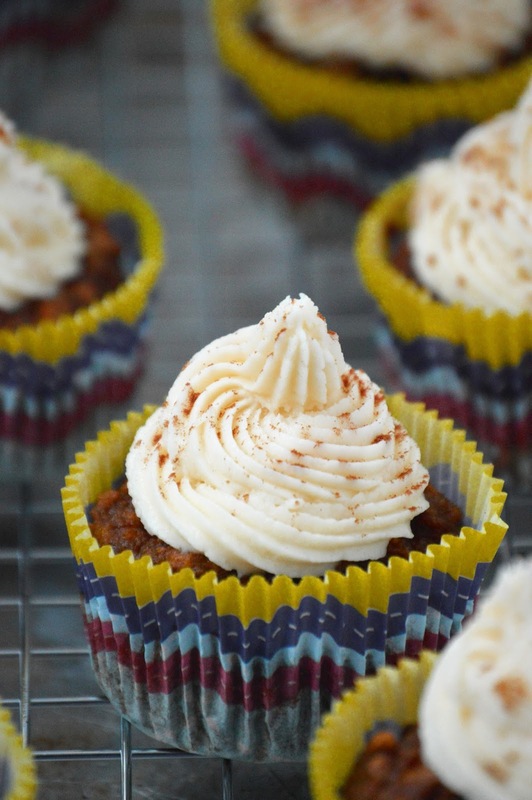 Fill a piping bag with cream cheese frosting and frost away with your favorite piping nozzle! YUM! I wonder if you could use vegan cream cheese..
Hi! I'm not sure!! It's definitely worth a shot :) Let me know how it goes! What could I use to substitute for coconut flour. I use coconut oil but I absolutely cannot stand coconut taste, so coconut flour is out and so is flaked coconut. What could I use instead to keep this a healthier recipe? I just discovered your blog via the Honeyville site, I'm looking forward to checking out your recipes, I'm excited to do so!!! I've been eating wheat-free for about 2 1/2 years and follow a plan that isn't quite grain-free, but is limited, otherwise very similar. Thanks for sharing your expertise and your recipes!!! Best wishes, Joanne L.